Tanu and Tarak are used to the attention. They stand tall and poised, with an air of self-contained elegance, their heads held high, refusing to acknowledge anyone’s presence. Even at first sight, it’s clear these are no run-of-the-mill dogs. You cannot distract them in any way, or even talk to them as you would with another canine. Petting is certainly not advisable. More than rules, this is a matter of etiquette.Tanu and Tarak are soldiers in the Indian Army and they are treated as such. Lounge met them on a weekday morning in March, a day after their return from a rigorous two-month field trial in the higher altitudes of Jammu and Kashmir, as they slowly readjusted to the heat and daily training regimen at the Remount and Veterinary Corps (RVC) in Meerut, Uttar Pradesh. The army announced last year that it would be inducting into its ranks Mudhol Hounds, a kind of canine bred especially for hunting in the 1920s by the Ghorpade kings of Mudhol, a kingdom in what is now the Bagalkot district of northern Karnataka. The first batch of eight have all qualified as explosive detection dogs. Officials at the RVC have arranged a short demonstration. Tanu and Tarak will display their level of obedience, agility, scouting and detection skills. When commanded, the dogs run effortlessly across the extensive training ground at the RVC, jump hurdles, climb rope bridges, scale walls, and even chase a motorbike. They’re both tremendously athletic. It takes them no time to rev up and streak across the field, their lean, long legs barely touching the ground. “They look like they’re flying," says their handler with evident pride. A Mudhol Hound postage stamp. They’re about the same age, nearly three years old in human years, but Tanu is taller, leaner and more obedient than Tarak, who has to be nudged to detect explosives from one of the seven boxes laid out on the field. His handler suggests the long journey has left him tired. He sniffs every box. When he finds the one with RDX, he sits down next to it, as he has been trained to do. His handler looks pleased and gives him a tiny treat. Four of the eight dogs are currently touring cantonments all over the country to demonstrate the suitability of the breed to army work. The RVC, currently the only facility of its kind in India, is specifically built to train military horses and dogs. Spread over 200 acres in the Meerut cantonment, this state-of-the-art dog training facility has so far worked with only two breeds, the Labrador and the German Shepherd. It’s responsible for the breeding, rearing and training of dogs that are then deployed across the country as combat dogs. The army uses them for various functions: infantry patrol, tracking, assault, mine detection, explosive detection, search and rescue and avalanche rescue, amongst others. Trainers at the RVC say the decision to include an indigenous breed is still in the trial phase. The army has been wary of all the attention the dogs have received since last year. 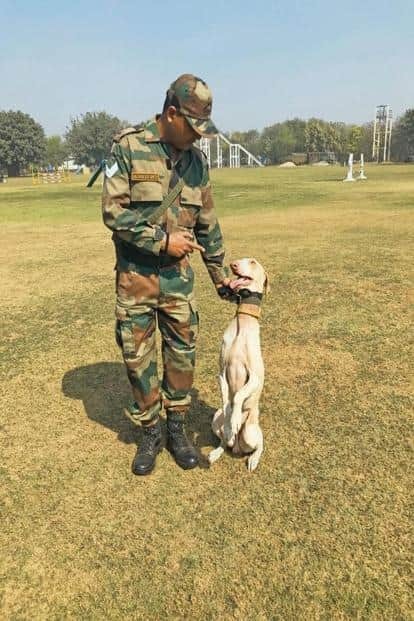 “The Indian breed will not be replacing our highly skilled dogs from other breeds, but they’re a welcome addition to the family," says a training officer. “We are happy with the trial so far. Mudhol Hounds are easy-to-maintain, hardy dogs, used to harsh Indian conditions and resistant to diseases. They do not require much food and do not bark, which is ideal for the battlefield. They can cover long distances without getting tired. They detect smells easily. They’re ideal for deployment in ED (explosive detection)." There’s one glitch though. Can dogs from the heart of the hot Deccan plateau adapt to colder climes? “That could be a challenge. We’re waiting to see the results from the field trial in Kashmir. Still, they could be used during operations in the North-Eastern states. There are many other possibilities," says the officer. If the field trial results are favourable, more Mudhol Hounds could be inducted as early as this year. The hounds have a long and varied history. It is believed that the breed was a favourite of the Marathas, fighting alongside them in their wars against the Mughal and British armies. The breed first found fame when it was patronized by Raja Malojirao Ghorpade (1884-1939), who was greatly impressed by the hunting dogs used by the trappers and peasants in his kingdom. He interbred the purest of the dogs and gifted a pair to King George V, who bestowed the name Mudhol Hound on them. The antecedents of the breed, however, can be traced back to traders and invaders from central and western Asia who came to India from 500 BC onwards, according to research by B.C. Ramakrishna and P.Y. Yathinder, who write on Indian dog breeds. The Mudhol Hound is a descendant of some of the dogs they brought with them, probably the Sloughi (from North Africa), the Saluki (from the Middle East), and the Greyhound. These breeds were crossed with local Indian canines and evolved into new native species. The Mudhol Hound might be perceived as a hunting dog of royalty, but, like most Indian breeds, it belongs to the common people. In villages in the Deccan, the Mudhol Hound is known more commonly as the Caravan Hound, as the dogs would run alongside the caravans of their masters. S. Theodore Baskaran, a nature writer from Bengaluru and author of The Book Of Indian Dogs, says on the phone, “Indian dogs, like the Rajapalayam, the Chippiparai and the Rampur Hound, have all traditionally been raised by the working class, hunters, trappers, farmers and shepherds, and the Mudhol Hounds are no exception. Any attempt to conserve the breed must take into account the role of the common people." When the army decided to draft an indigenous breed, it turned to the Canine Research and Information Centre (Cric), which happens to be located in Mudhol. Cric, set up by the Karnataka government in 2010, is the only institution of its kind in the country. It helps in the conservation of the Mudhol Hound by engaging marginalized communities to raise the dogs. Some of the families are able to supplement their livelihood by selling the dogs. As a result, the population of Mudhol Hounds has risen from 1,000 to 3,000. “More than 1,300 families from the area are involved in the conservation of the breed. We train them and provide them support to ensure breed quality. We also take care of food supplements and vaccinations," says Mahesh S. Dodamani, head of Cric. He visited the RVC once to check on the progress of the dogs and is naturally partial to the breed. “The Mudhol Hounds have trained very well. They were great at the track events and could complete in 1 minute what the Labradors would take 90 seconds to do." “It was long believed that Indian breeds could not be trained, that they’re only used to being in the wild," says Baskaran. “But the army has broken that myth with the Mudhol Hound. This will turn our attention to other Indian breeds, who are all part of our living heritage." For the Mudhol Hound though, it’s just another day of chasing and hunting.